It seems like it wasn't all that long ago that Free Money Finance was celebrating it's 1,000th visitor by giving away three mini stuffed moose. Well, today we just went over 5,000!!! All I can say is thank you so much to all of you who are reading. I never take your visits here for granted and always try to post things that will help to increase your net worth. 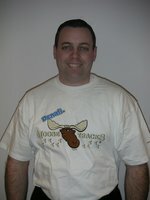 As a thank you, we'll be giving away three Moose Tracks t-shirts (pictured here -- click on the photo to see a larger image) provided by our sponsor, Moose Tracks ice cream. To win one, simply leave a comment below (you can say anything). I'll let everyone comment for a week, then select the three winners at random and post the results on this site. Then you can contact me and we'll arrange to get you your shirt. You can make one comment per day for the week leading up to the drawing. That way, you'll have seven chances to win. Thanks again for your support of Free Money Finance and good luck in the drawing!!! Great site. Read this blog every morning! Very informative.Thanks! Great Site, I am regular reader! Great Site! Not sure if you already have it, but would like to see your portfolio online. Yours is the first blog I've ever read, and I have to say, I'm impressed. Thank you! I'll jump in and participate- Definately one of the must reads everyday on my list. Okay, I'm a newbie and love the site.. But tell me where I can find MooseTracks Ice Cream- It looks Scrumpdelicious! Found your site via business week. Great information....! This is like going church everyday. I'm a newbie, but your site got me hooked. You're on my favorites list. Cool site! great info and nice of you to do this for us all. A friend shared how he had such a hard time saving money. I told him I like to "pay myself first," using my companies' tax deferred vehicle to amass funds. My friend later began my strategy and told me he loved it! New to everything...what's a blog? MOOSE TRACKS...I thought that was just for hunters, but I can always eat ice cream and be needin a free T-Shirt!!! So hows bout handin one over. Oh yeh...PLEASE and THANK YOU!! !